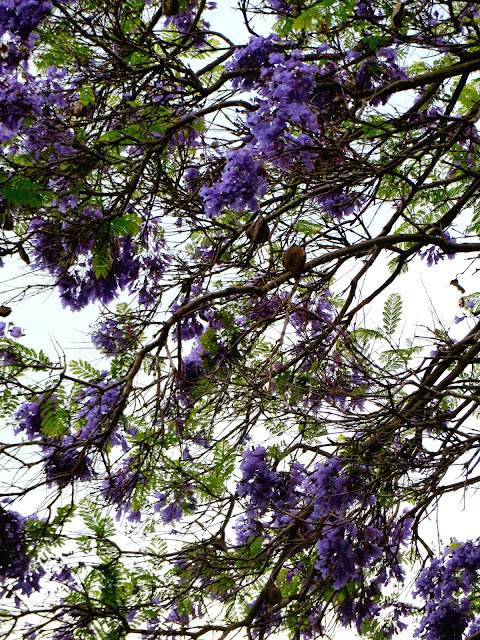 Jacarandas are a very divisive tree here in Los Angeles. Some people here love them because they are exotic, beautiful and, in my opinion, just the perfect shade of purple. (I think you can already see where I stand on the debate.) Other, more practical people, such as my husband, hate them because they leave their sticky petals all over, clogging up pool filters and leaving a mess on sidewalks and cars that is nearly impossible to remove. Where you stand on the debate seems to not just show your preference about trees, but rather, how you view the world around you. Do you want to enjoy the moment and take in the beauty of life, even if it means being oblivious to practical concerns? Or do you want to be realistic and pragmatic and in doing so eschew the joy in the world that surrounds you? In other words, are you a romantic or a realist? How you feel about these trees seems to put you in one category or the other. As you can tell, my husband and I are caught on two opposite sides of the spectrum, but as they say, opposites attract. 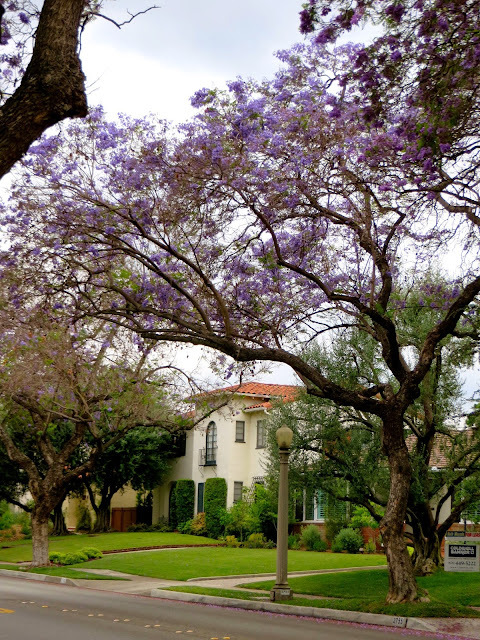 Being in the pro-jacaranda camp since I moved out here, my devotion to the tree was further solidified when Huell Howser did his final episode of California's Gold on the Jacarandas. I have to admit, this episode brings a tear to my eye every time I see it and it takes a lot to make me cry. Among other things that will pull on your heart strings, the episode features a blind woman who, when formerly sighted, loved these trees and, despite loosing her sight, walks regularly down a street lined with jacarandas to feel close to them. This Huell Howser episode also features a minister who stated something along the lines of "you can live life like everything is a miracle or you can live life thinking everything is a nuisance". While I don't always live life thinking that everything is a miracle, it's not bad advice and, as I stated earlier, it appeals to my more romantic sensibilities. 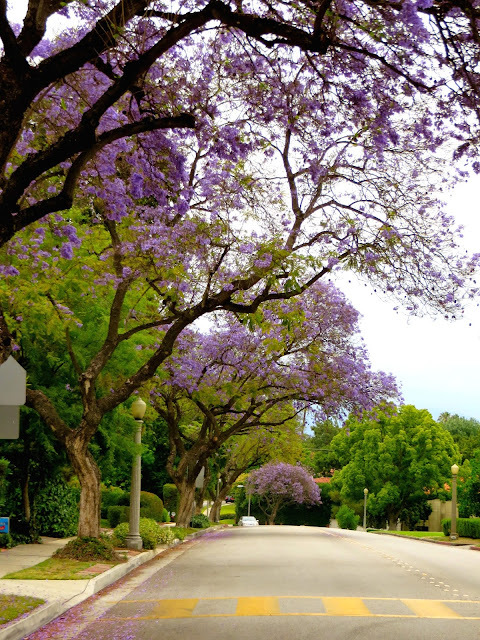 In that spirit, last weekend when my husband and I happened upon a street lined with jacarandas in Pasadena, we pulled over to stop and took a few minutes to enjoy the splendor and beauty of these majestic trees. On the other hand, we also made sure to park our car far way from the trees, which maybe just goes to show that there is a middle ground for everything. 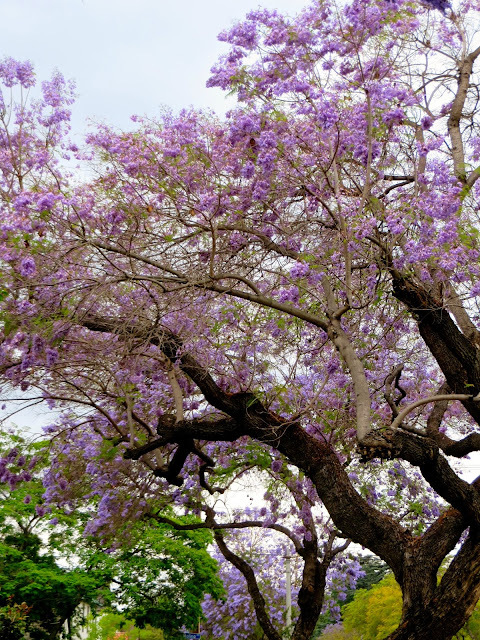 For example, in marriage, compromise is most certainly the key to success and apparently also with enjoying these Jacarandas, so with out further ado, enjoy the rest of my jacaranda photos! These are stunning. 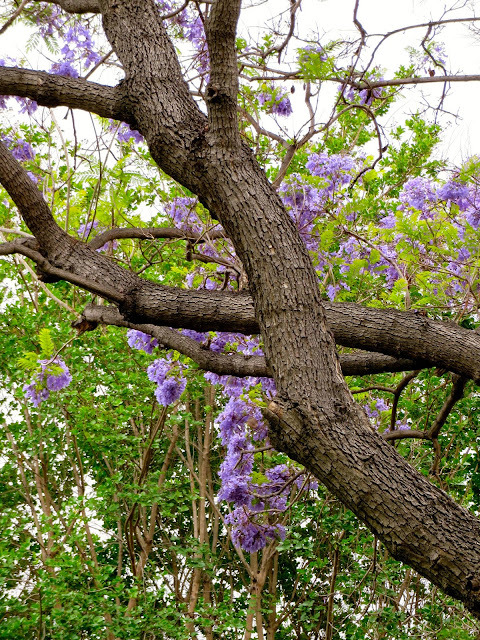 I've never seen this kind of tree before but they are very beautiful. Yes, the trees are quite amazing! 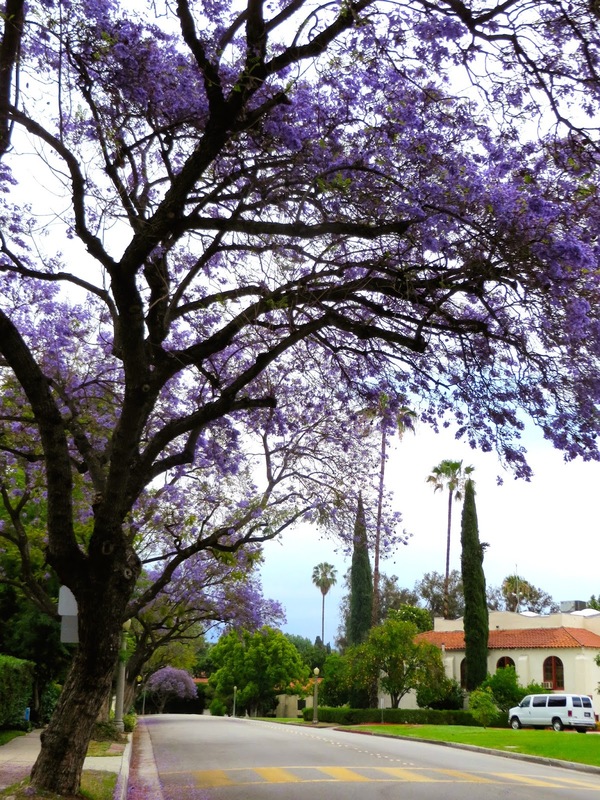 They are all over different regions of Southern California.